Reef aquarists know what happens when they allow the pH of their tanks to drop. Corals are affected adversely. Scientists are warning that increasing amounts of carbon dioxide entering the atmosphere as a result of human activities are contributing to coral reef destruction worldwide due increased acidification of the ocean. Add this to the other stresses to which reefs are subjected, and we have a recipe for ecological disaster. These days, reef biologists continually refer to “the coral reef crisis,” by which is meant the accelerated loss of reefs that has taken place in the past few decades. No one argues that reefs are in trouble worldwide. Most of the scientific disagreement regards the exact nature of the particular stress(es) responsible for local observations of reef degradation. It is often difficult, if not impossible, to tease out a single destructive factor from the plethora of insults to which reefs are subjected on a daily basis. Pollution, overfishing, and climate change all take a toll. The cumulative result of all these problems has been the loss of as much as one-fourth of the world’s reefs. 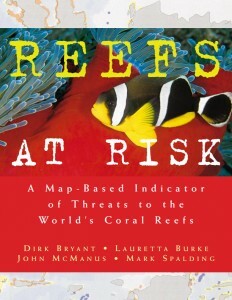 Reefs at Risk, a report of the World Resources Institute. The world has only about 225,000 square kilometers of coral reefs. This sounds like a lot, but it represents only about one-third the area of Texas, or ten times that of New Jersey. Despite the relatively small number of reefs, it is estimated they provide economic benefits in the range of US$30 billion per year worldwide. Tourism accounts for a large proportion of the economic activity generated by reefs, and is adversely affected when reefs are damaged. In the late 90s, for example, about half the corals in Palau died from a major bleaching event, and by 2001 tourism had declined as much as ten percent. A tiny fraction of both economic benefit and reef destruction, of course, is accounted for by the aquarium trade. The most recent estimate I could find placed the value of the US aquarium trade in reef organisms at half a billion dollars. The aquarium trade remains in focus as a contributor to reef degradation. The issues, therefore, remain much as they were a decade ago. Rather than being seen as a tool for education about reefs and reef conservation, the aquarium trade is seen as part of the problem. The most significant effort to address the problem by the aquarium industry, the Marine Aquarium Council (MAC), www.aquariumcouncil.org, is widely considered to be impotent. While MAC promises that certification leads to healthier fish and lower mortality, the retail dealers with whom I have spoken say this is not the case. Many cite problems associated with handling by wholesalers and difficulties related to air cargo shipment. These problems as equal to, or greater than, those arising from destructive fishing practices, the issue that spawned MAC in the first place. One thing is for sure, as reefs decline, calls for regulation of the marine aquarium trade will increase. Efforts to discourage marine aquarium keeping have become quite sophisticated. Check out the video link below, posted exactly one year ago today. Be warned. If you think the marine aquarium hobby does more good than harm, the video will likely offend you. But rather than getting your dander up, try to think of what the hobby and industry might do to counter such criticism. Email me with your ideas. According to the Pacific Fisheries Coalition (a project of the Hawaii Audubon Society), 80% of Saltwater Aquarium Fish Come From Hawai’i. REALLY? I felt compelled to do a bit of fact checking on the above video from 2008 by the Pacific Fisheries Coalition (a project of the Hawaii Audubon Society) as we revisited this post from John Tullock, originally published on our older website Microcosm Aquarium Explorer. It seems insufficient to just leave 3rd-party claims at the end of an article without noting that there are some pretty substantial flaws and egregiously incorrect information in what is presented. 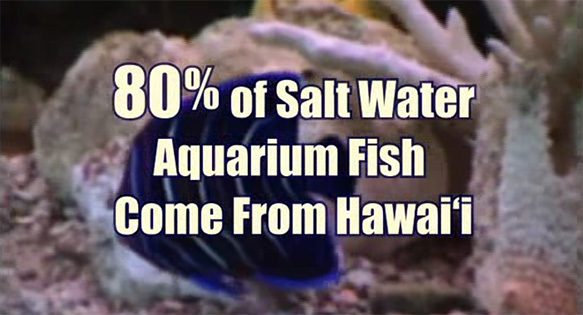 To start, I’m pretty sure that 80% of the marine aquarium fish in the US do not come from Hawaii as this video states. How do we know this? For example, the video states that 400,000 fish are harvested per year in Hawaii. Not bothering to verify that data, import data made available by the New England Aquarium suggests that in 2008 alone, 553,664 Green Chromis, Chromis viridis, were imported to the US from the Philippines alone. The year this video was created, we imported more of a single species from an international source than all the purported harvest in the state of Hawaii. Simply put, suggesting that Hawaii supplies 80% of the marine aquarium fish to the US hobbyist, even back in 2008, was utter mathematical rubbish. As we’ve seen time and again in the past several years, when pushing an agenda, “facts” just get in the way. Debate over Hawaii’s Aquarium Fishery is rife with such misinformation which ignores or miscontrues the data presented by fisheries managers. Factual inaccuracies in this video don’t end there. The Flame Angelfish, Centropyge loricula is not solely endemic to Hawaii as the video suggests, but can be found throughout the Pacific and is often collected in the Christmas / Marshall Islands. Not “all” captive-bred fishes are disease free as this video misleads. I’m betting that with further research, additional “facts” presented in the above video would be at minimum misleading or inaccurate as well.